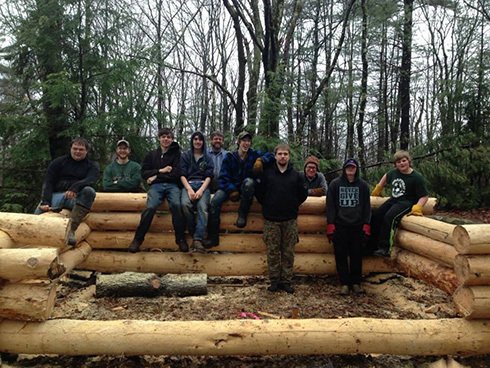 As 17-year-old Earl Grennan of Springfield, Vermont, approached the biggest step of his Scouting life – his Eagle Scout project – he pondered what he should do. 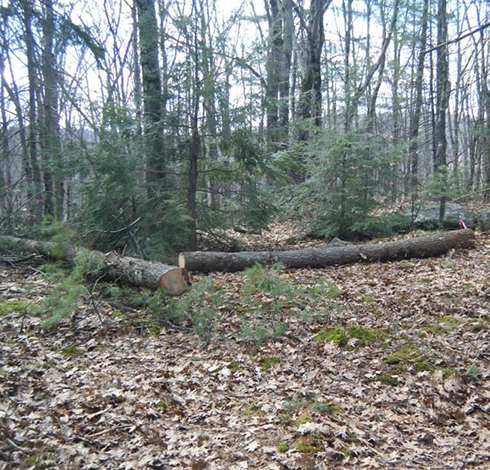 He wanted something out of the ordinary, something that would “last a lifetime.” Along came the Pinnacle Association with a plea for just such a project: a log shelter to be built set back from a ridge in Grafton! Earl embraced that challenge and set about planning the design of the shelter, figuring the equipment and access he would need, and securing the necessary approvals and help for the construction. Then the long, hard, snowy winter of 2013-2014 arrived and lingered. Boy, did it linger! 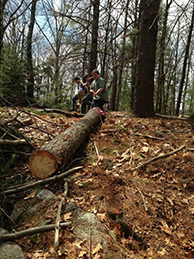 First logs are moved into position atop ridge with view. Because of the deep snow, access to the site for the old-fashioned construction was delayed for so long that suddenly less than three weeks remained for Earl to start and finish his project before the deadline: his 18th birthday. The first day the Scouts could physically get to work, three feet of snow still covered the ground. The day was freezing and rained continuously. 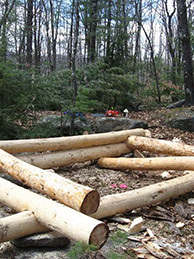 The Scouts from Troop 206 out of the First Baptist Church in Chester and adult volunteers had taken up chain saws, debarking tools, and ropes and pullies to prepare the necessary logs from trees in the area. Some of the trees, and rocks for the foundation, had to come from 150-200 yards away. In the freezing and cold conditions, the boys kept moving – not daring to stop to light a fire. This hurried pace to meet the deadline continued as schedules allowed. One additional complication was that it was dangerous to have more than five workers on site when the trees were being felled and dragged. Safety was a paramount concern and assignment for Earl as project leader. 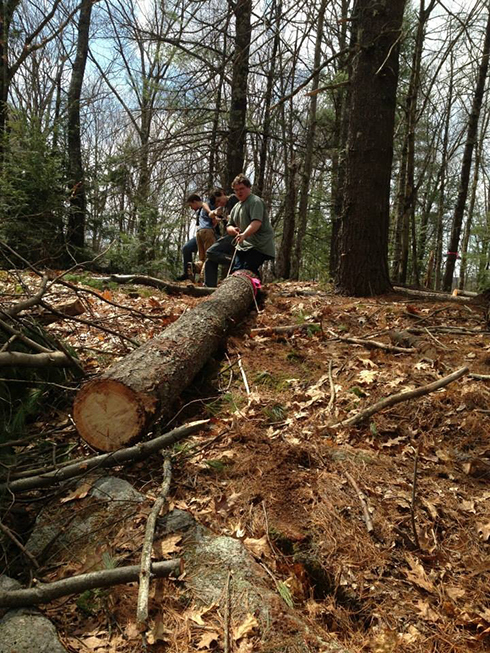 Earl leads Scouts in dragging a felled tree toward the shelter site. Another limitation was travel time. Most workdays lasted for seven hours, but after meeting at the Chester church at 10 AM, there was travel time by car to the parking area, then a half hour to hike to the site, as well as time to unload and rest and organize. Typically workers got to the site around 11:10 and left around 4 or 5 PM. 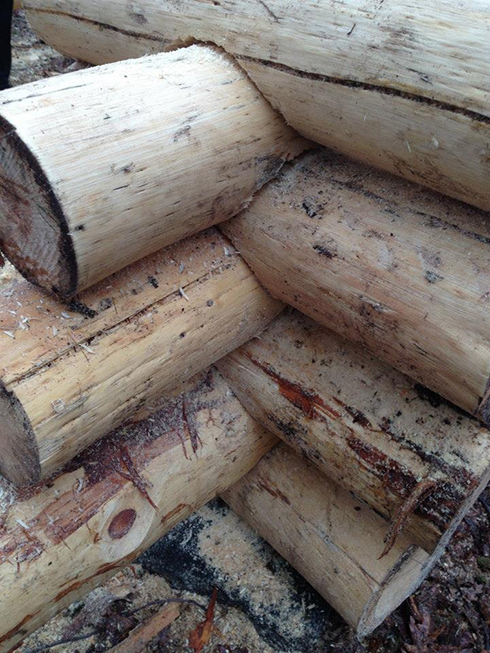 Debarked logs start to form the walls. On the last day available, a crew of 23 people ages 11-42 that included seven current Scouts, some Troop alumni, the Scoutmaster Tom Charlton, friends of Earl and his Mom, and sundry nieces and nephews gathered in an all-hands-on-deck effort to finish Earl’s part of the project. 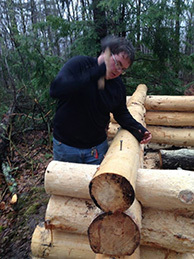 In spite of the long, snowy winter that was out of his control, Earl and his fellow Scouts managed to finish his assignment – namely the foundation and major walls – just before his 18th birthday. The shelter has designed outside dimensions of 16’ x 12’, with an interior space of 14’ x 10’. The end walls will be about 8’ high. The present walls are 8 logs high and reach over 5’ tall. Reflecting on the project, Earl said it was most satisfying to see the project coming together each workday and to imagine how many people might use the finished shelter. 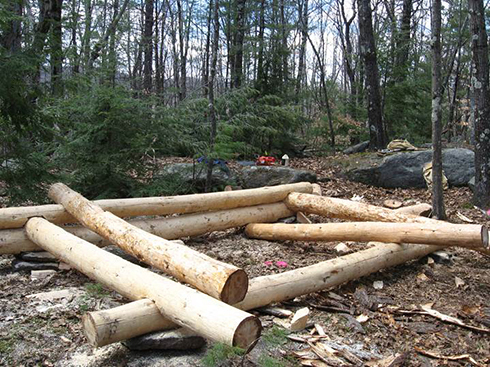 Although Earl’s part of the project is done, his fellow Scouts want to see that shelter finished. We shall see how the Troop or other aspiring Eagle Scouts contribute to the completion of this marvelous shelter. Detail of a joint in the log wall. 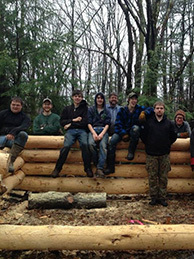 One of the major parts of an Eagle Scout project is to demonstrate leadership. Asked what he has learned in that leadership position, Earl replied that he needed “to have contingency plans for every contingency plan!” He had to foresee problems and possible dangers and prevent dangerous situations. He had to instruct the boys carefully and get their attention regarding potential dangers – a few flying chips and falling trees made them realize that although Earl might be their own age or younger than some, he was in charge and had assessed the problems; they had to listen to him and obey his orders. 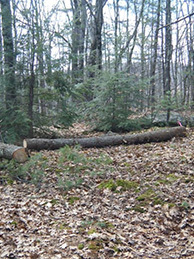 The safety of all was at stake: they were dealing with big power tools, saws felling big trees, and the task of dragging heavy logs. Earl also learned that it is imperative to allow more time than anyone would expect to get the jobs done and to complete a neat, safe project. He would recommend to other Scouts that they allow 6-7 months to plan their project and extra time in case weather complicated the process. In the end, in spite of the weather, Earl did it! He completed a very demanding Eagle Scout project – one that will, when finished, be exactly what he wanted: an impressive, meaningful, and lasting project that will be a positive resource for hikers for years to come! The Pinnacle Association thanks Earl for a job well done. Earl’s Eagle Court of Honor was on November 22, 2014. Proud workers pose at the shelter walls. Earl is at left. Bearded Scoutmaster Tom Charlton is in the center.